“Immaculate Conception Continues” from Christian Faith Publishing author Edna Thomas is the life story of the author as a woman who has overcome severe challenges in life. “Immaculate Conception Continues”: a look into a unique life that has been touched heavily by adversity. “Immaculate Conception Continues” is the creation of published author, Edna Thomas, who is considered a down-to-earth kind of woman with little desire of being regular. Published by Christian Faith Publishing, Edna Thomas’s new book allows readers to delve deep into the life of the author. Through this book the trials that the author went through in life are on full display for the reader to learn from. Through the distilled wisdom of someone who has seen a great deal, readers can experience a very unique life. With a myriad of stories covering a variety of emotions this book will surely keep readers turning the page. View a synopsis of “Immaculate Conception Continues” on YouTube. Consumers can purchase “Immaculate Conception Continues” at traditional brick & mortar bookstores, or online at Amazon.com, Apple iTunes store, Kobo or Barnes and Noble. 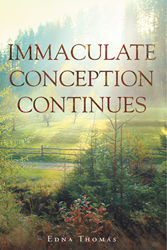 For additional information or inquiries about “Immaculate Conception Continues”, contact the Christian Faith Publishing media department at 866-554-0919.